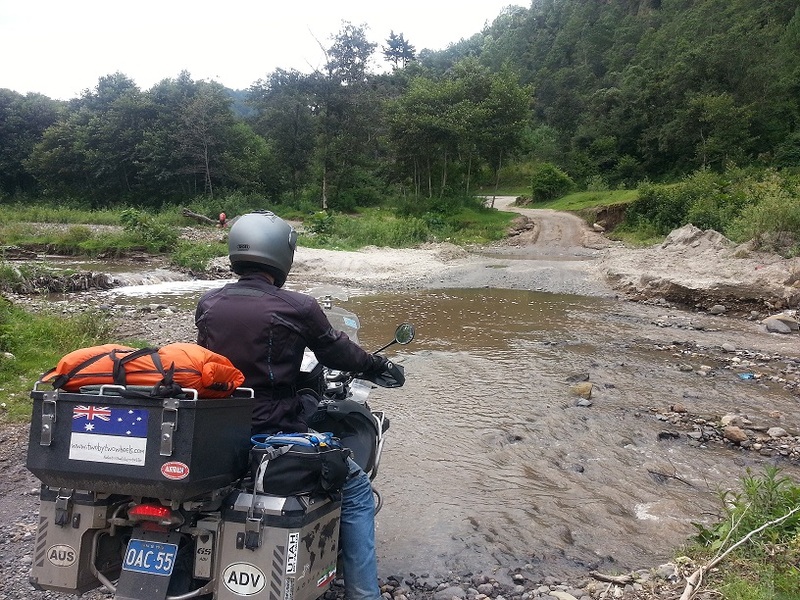 Adrian about to cross a river on the BMW after we got to the bridge… and found it had washed away. 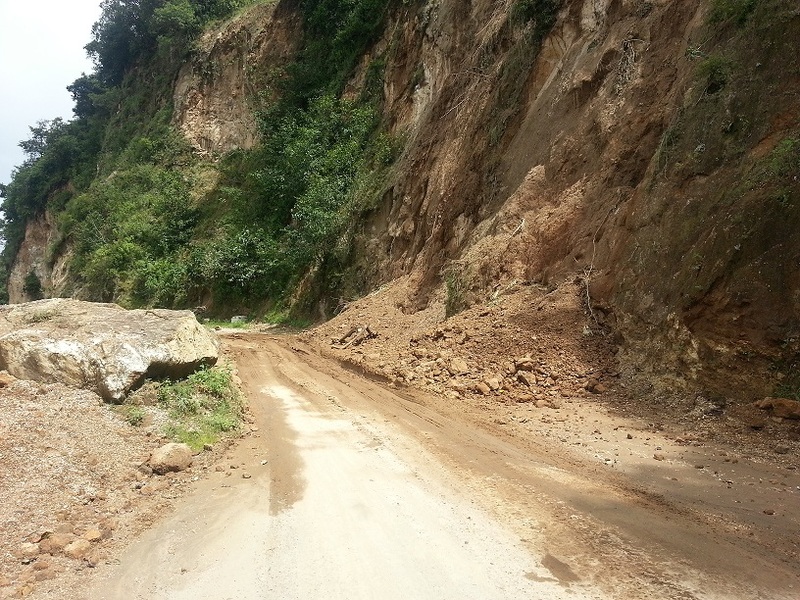 Today was a day for the adventure bike riders: windy roads, a landslide across a fair chunk of the road, a protest blocking the main road out of one of the towns we needed to go through and a river crossing – because the bridge was washed away in a tropical cyclone two years ago and hasn’t been replaced!! 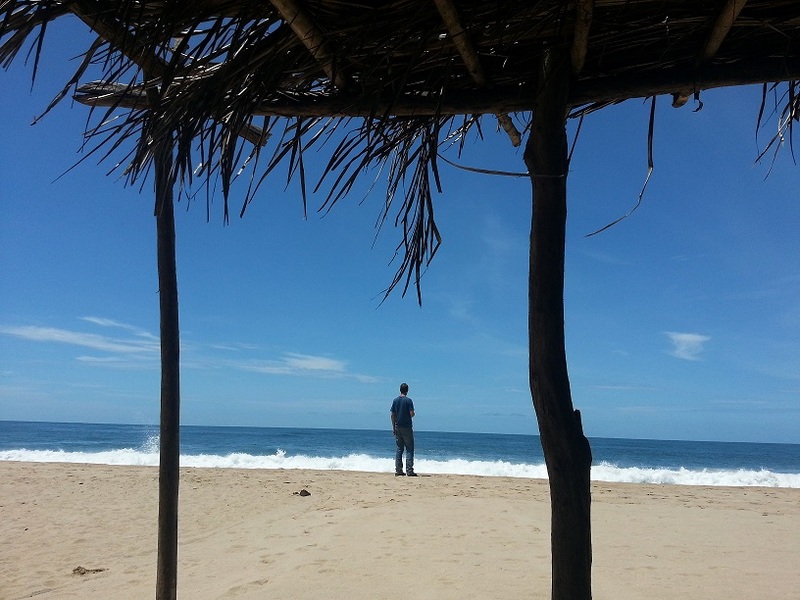 Yup, just another day on tour in Central America, where even a short stretch of 80kms can take you hours!! The day kicked off with breakfast with one of Adrian’s ‘brothers’ – a guy from Germany riding a BMW who’d spent the past five months riding from New York and is heading south to Ushuaia like us. We’d past him in the road yesterday on our way to our boat trip as he was just arriving into town. He’s the first ‘brother’ we’ve seen for a while, so Adrian was pretty excited – and I was looking forward to hearing about his experiences, too. So after that relaxed start (because we’d thought it was going to be a fast, easy day on the bike – ha ha), we started the lovely ascent up over the mountains surrounding Lake Atitlan, with gentle sweeping turns to keep Adrian happy and a lovely view over the lake and volcanoes for me. It was stunning. The clouds seemed to be coming in early and fast, so we were happy that we hadn’t dawdled any longer before getting going. There were no directional signs on the road (seems to be a reoccurring theme in Guatemala—the only signs for a city/town are once you’ve actually arrived… not very helpful for navigation) and Adrian’s GPS was making up roads that clearly didn’t exist, so we (read: Adrian) were using Zen navigation based on a rough understanding of where we though Antigua might be. And all was going well until, all of a sudden, the road was blocked with stones and we were forced onto a dirt track running sort of alongside where the road was. We didn’t have to wonder why for long: after about 200m, we could see that a bridge over a small river had washed away (some time ago – the trees growing out of the rough, broken edge of the asphalt were already knee high). 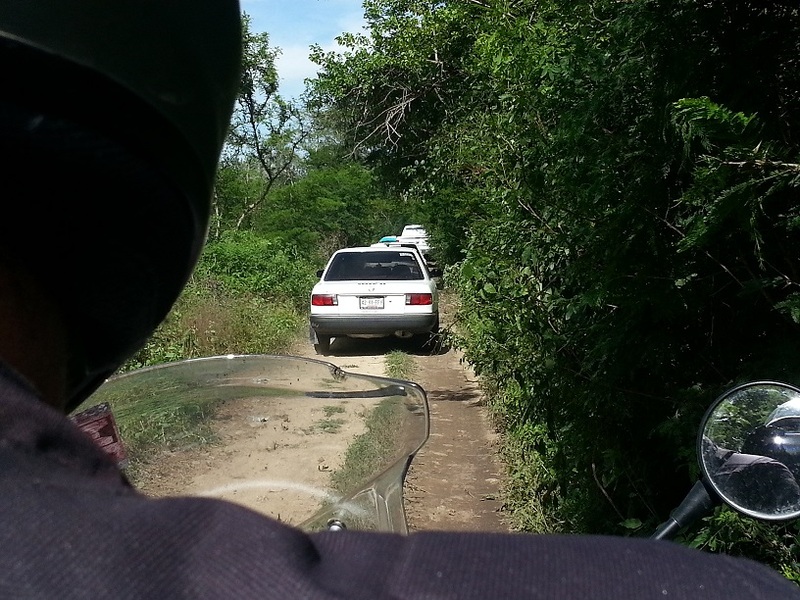 Our options were: turn around, go back through Panajachel and look for a road out going to Antigua the other way around; or ride across the river. It hadn’t rained at all yesterday and wasn’t raining at that particular moment, which meant the water levels were relatively low.. just over my ankles. The issue was more that the riverbed was very rocky – and although it wasn’t deep, we couldn’t see the bottom. Which made for interesting ‘cross-my-fingers-hope-not-to-drop-the-bike-in-the-water’ kind of riding for Adrian!! And me? I just walked across. Back on the bike, we continued on our merry way. The road got progressively worse… I guess there’s no need to maintain a road when, due to the missing bridge, it’s essentially impassable anyway. In the next town, we were redirected by the police into a small backstreet going in the opposite direction to where wanted to go. Again, detours here aren’t signposted – so you’re directed off the main road and then essentially left to your own devices to navigate, on rough cobblestone and multiple one-way streets, your way around whatever the mysterious blockage is that caused you to be directed off the road in the first place. We picked a car to follow, hoping that we’d get lucky and the car would lead us out of the town. Eventually – after one wrong turn that nearly saw us end up in the middle of the protest that caused the detour in the first place – we came to another fork in the road with a police man directing traffic. I jumped off the bike to ask him which way to Antigua – and we were off again! And then it started raining, and then the roads flash flooded, and then the sun was shining and our wet weather gear dried in the sun and the wind, and then we made it to Antigua!!! It wasn’t quite the nice and easy 80kms I’d imagined – which I guess really captures the essence of this trip. Every day is an adventure, and the only thing that’s worth expecting is the unexpected. The further south we travel, the better the beaches get. 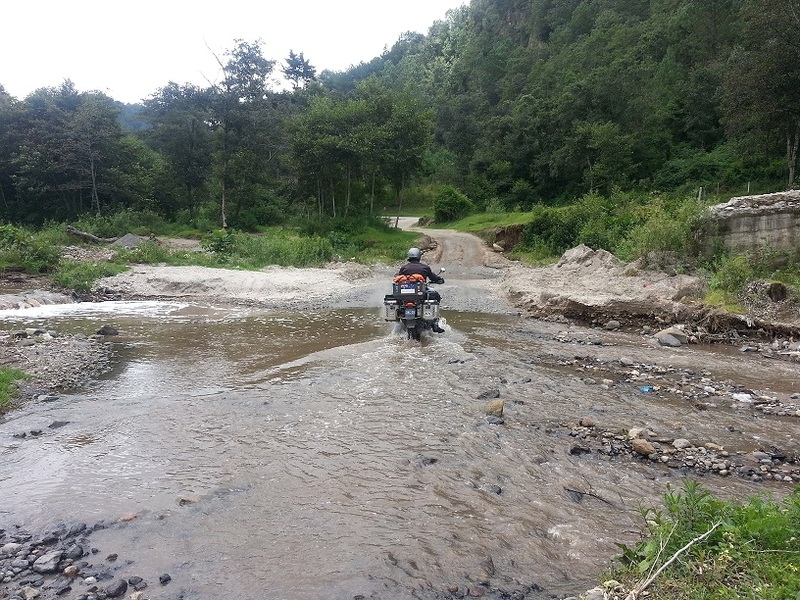 In equal yet opposite proportions, the roads get worse. I don’t want to harp on about the roads.. suffice to say that they are terrible, in every sense of the word. I’m so grateful that I don’t have to drive, that’s for sure. It’s hot, sweaty and at times stressful work just being a passenger! Today’s travel included at least 50 speed bumps – including several on highways, where we’re generally not travelling at a speed bump friendly speed. At one point, we paid for the privilege of a toll road / tunnel through a city of over 2 million people… only to have the tunnel – three lanes of smoothly tarred road with actual lane markings – disgorge us abruptly, like an unexpected and surprisingly juicy burp, out onto a two-lane dirt road. Chaos. It was utter chaos. It was hot and we were tired and not at all excited about the prospect of a night camped next to the bike in a queue of trucks on the road. So when a couple of locals pointed out a way around the blockage through backstreets (and, as we subsequently found out, ankle deep mud, bog, sand and pretty much any other un-motorbike friendly surface you can imagine!) – we thought it was worth a shot… especially when a couple of other smaller cars seemed to be taking it, too. And – we did make it around the jam… but not without several extended patches with Adrian riding the bike solo and me, dressed in full motorbike regalia including boots and helmet, running (yes, running!) along behind the bike, through the mud, in the heat, trying to keep up. It would have looked hilarious – a couple of gringos traipsing through the back country, massively overdressed by Mexican standards, with this girl running and sliding along behind a guy riding and sliding what was possibly the biggest motorbike they’d ever seen. It was not our happiest moment on the bike (or off the bike, in my case)!!! Anyway. Onwards and upwards.. or, to be more accurate, southwards. We’re in Playa Ventura. It’s apparently an ‘it’ destination… in December, January and February. In August, I can vouch from first-hand experience that there are very few tourists in the town. We were the only ones at our hotel – and possibly the only ones in the town at all. And we were definitely the only non-Mexicans. The beach is very rough and rocky so there was no swimming for us… and almost no dinner, too… by the time we ventured out for some food, around 8pm, pretty much anywhere that was actually open at all had closed… and it took one local taking us to his brother’s cousin’s place (or something like that) where a lady took pity on us and ceased watching what appeared to be a Mexican soapie to make us (a very nice) dinner. A good end to a long day. Quite a nice place to stop for lunch! 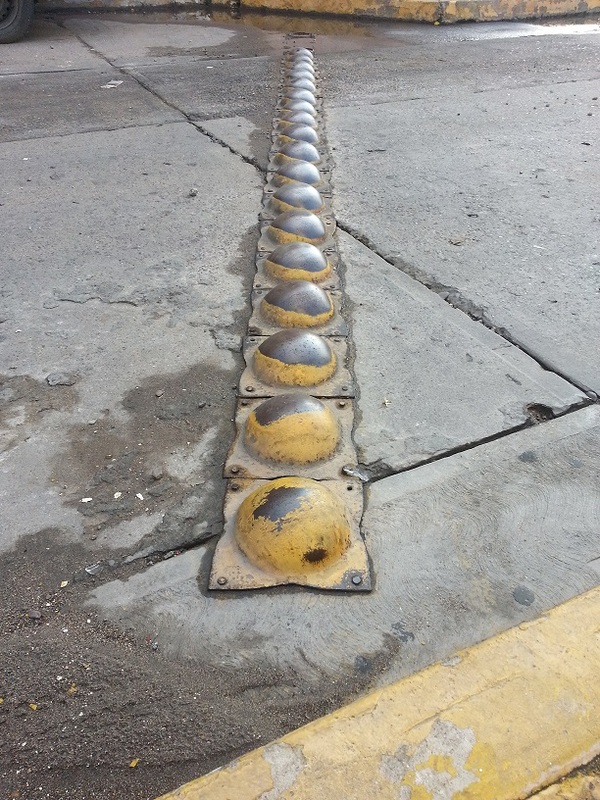 Topes – this is just one example of the many, many types of speed bumps they have here. We had a late start today because we were tired and then decided to walk to a café for brekky. Although – I don’t think it’s reasonable to call a shop that sells pastries/muffins and warm brown water or super milky drinks with a sniff of coffee in them a café. To me, ‘café’ implies “the coffee here is good.” And I’ve not had a good coffee experience here yet! I am getting close to the point of going coffee-free for the rest of the trip, it’s just too disappointing to see a good looking espresso machine and be all excited… and end up with a limp frothy milkshake. 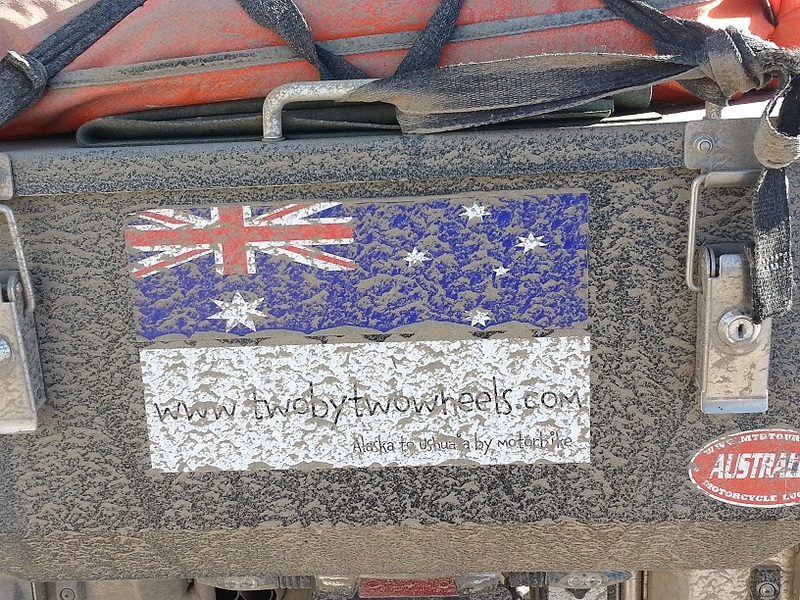 Oh so muddy… the back of my motorbike jacket also looks like this! The roads weren’t very interesting, and we were both looking forward to Jasper! It rained pretty much all day today! Luckily however, the wet weather gear held up again – and we resolved Adrian’s leaky glove issue, so he also stayed dry. Nothing to report really as we spent most of the day on the bike.